Danny Peterson | 9/11/2018, 5:15 p.m.
Dr. Danny Jacobs, the first African American president of Oregon Health and Sciences University, said he’s setting in place the steps necessary to successfully steer the university at the challenging intersection of education, patient care, and research. That was a challenge made all too apparent when, just three weeks into Jacob’s tenure, a sudden exodus of four heart transplant cardiologists rendered Oregon’s lone program for such procedures in limbo. 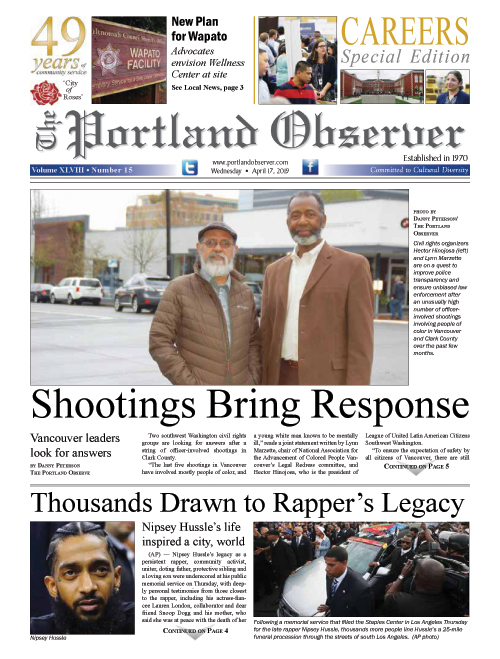 The Portland Observer reached out to Jacobs for comment and in response the university sent a statement announcing the program was indefinitely suspended after an initial two-week suspension. A statement said OHSU officials would begin an independent peer review of the heart transplant program in October that will be responsible for determining the issues that led to the suspension and according to Jacobs, “what we need to do better,” including the quality of patient care, supervision of the program and staff and their education. “Everyone regrets this disruption our patients are experiencing in their care. The key message for me is the peer review process will help us be patient-centered and bring the program back as quickly as possible,” he said. The distress that the suspension caused for the university’s 20 waitlisted heart transplant patients, some of whom transferred to other facilities, was something the university said it profoundly regretted. “We are deploying every resource at our disposal to ensure they have immediate and ongoing care,” the statement read. Jacobs, who is the fifth president of Oregon’s only academic health hospital, took over duties last month from Dr. Joe Robertson, who retired as OHSU president after being diagnosed with multiple sclerosis last fall. In May, the university board of directors unanimously approved the selection of Jacobs, 64, after a months-long search. Jacobs told the Portland Observer that his previous six-year tenure as the executive vice president, provost, and dean of the School of Medicine at the University of Texas Medical Branch helped him understand the challenges of running an academic health center. Jacobs, whose calling to science and servicing communities set him on the path to medical school early on, will oversee all of the Portland-based University’s operations, which include the recently completed Knight Cancer Research Building. The state-of-the-art, 320,000-acre cancer treatment and research facility, which held an open house Saturday, was funded by the Oregon Legislature and the OHSU Knight Cancer Institute and holds the lofty aspiration of eliminating cancer completely. Thousands of donors invested in the project as part of a fundraising challenge by Nike co-founder Phil Knight and his wife, Penny. Jacobs said the way the state legislature, governor, and citizens of Oregon coalesced with OHSU to fund the center was something he admired even before taking the position. “The tremendous spirit of collaboration is one of the attributes that drew me to OHSU,” Jacobs said, adding that he’s eager to see the scientific progress that comes out of the facility.